Early Times has been around since, well, early times, but with the introduction of Early Times 354, we are reintroduced to legit Early Times bourbon. You see, the Early Times that we are used to is NOT a bourbon…its just a whiskey. Bottles of Early Times didn’t meet the qualifications for being called bourbon, since the Black Labels didn’t use brand new cooperage. Early Times has been a Brown – Foreman brand since the company acquired the brand back in 1923. Since then, they have grown Early Times into the best selling whiskey in the United States. Early Times is also the best selling Kentucky whiskey in Japan. Part of their success can be more recently attributed to the fact that in 1987, Brown-Foreman established a contract agreement with Churchill Downs, home of the Kentucky Derby, to make Early Times juleps the “official drink” of the Derby. As more and more drinkers are becoming aware of the difference between bourbon and regular old whiskey, Early Times 354 has become Brown – Foreman’s answer to ensuring the brand remains competitive and relevant. In a national, independent blind preference taste test, Early Times 354 was preferred to Jim Beam White Label by male, Jim Beam drinkers ages 25-55. Now, I’m a male, Jim Beam drinker, age 25-55 so I will be the judge of that! I don’t have a decent nosing glass at hand, so I get a whiff of the small, flask-shaped bottle. The majority of a human’s sense of taste comes from the nose, so we cant skip the nosing process of any tasting if we are to get an accurate description of a whiskey. I am met with the pleasant scent of fresh pastries that calm my apprehension (usually, a bourbon of this price either tastes like licking a cast iron skillet or taking a shot of gasoline). The first sips aren’t bad at all, either. Oranges, pears, and vanilla finish off with a solid wood expression in the finish. I must admit, this one is a little sweeter than I thought it would be, but adding some rocks to my neat pour really smoothes the whiskey out. 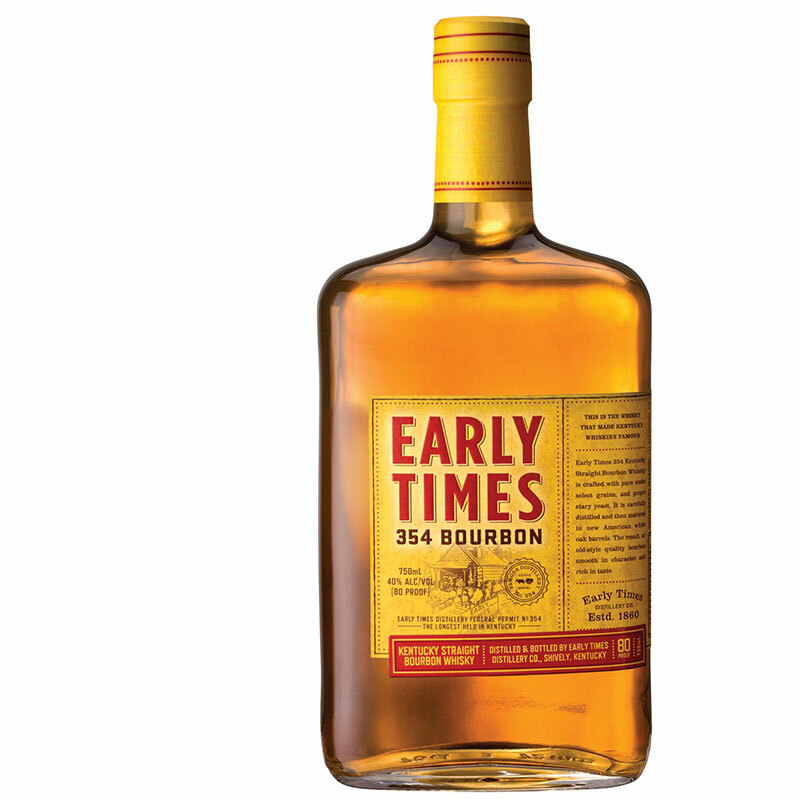 Early Times 354 is a sweet, light bodied, and pretty unremarkable whiskey. Not as bad as I thought it would be, but not something people are starting riots over. This is a low proof, bargain bourbon that I have been known to use as a well mixer very often. Not a must buy…not even a must try (even at $18), but still a solidly valiant effort. In my personal opinion, I do not prefer this stuff to Jim Beam White Label, but I will drink it in an Old Fashioned or a Manhattan. I give Early Times 354 a C+. Decent for the price point, but pretty unremarkable. Check out how we grade our bourbons. So have you tried Early Times 354? If so, what did you think? Leave us some tasting notes below!